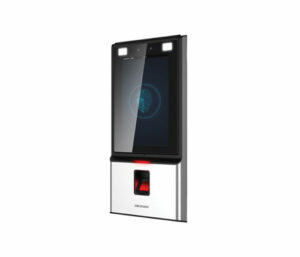 The Hikvision Face Recognition terminal is a self-contained image capture and display device that can be used to authenticate individuals by their facial details to allow access to buildings or facilities. In addition, there is a built-in Mifare card reader and the ability to add PIN code entry. The “F” suffix identifies that this model includes an optical fingerprint reader for a further level of security. A 2-pole connector is used to feed 12v DC power into the unit with one of two RJ45 connectors for network data. 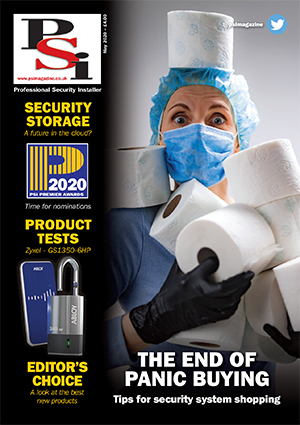 The 20-way connector provides access to features such as RS485, Weigand, door control and alarm handling. There are a number of possible wiring configurations depending on the level of security you require. In its simplest form it can be wired directly to a door lock and sensors or it can be linked to an access control system as an input device. It can be network linked to the Hikvision iVMS video management software as an access control device; a copy of this software is supplied on the CD. The unit has a fixed IP address which must be changed to suit the local addressing scheme. Hikvision SADP software can be used to find the device and update the IP address even if not in the same subnet. A strong password must be entered at first connection. In stand-alone mode the device’s menu can be accessed by a long press off around three seconds on the touch screen. This displays the password entry screen and when the input box is selected an alphanumeric Qwerty keyboard is presented.